Includes QR code Previous edition: 2016. Text on inside cover. 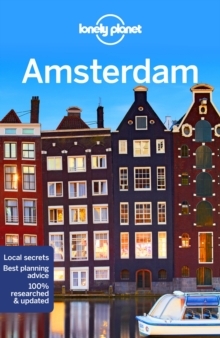 Lonely Planet: The world's number one travel guide publisher*Lonely Planet Amsterdam is your passport to the most relevant, up-to-date advice on what to see and skip, and what hidden discoveries await you. Soak up centuries of artistic masterpieces, cycle through the city's canal-woven core, and get gezellig in a brown cafe - all with your trusted travel companion. Get to the heart of Amsterdam and begin your journey now!Inside Lonely Planet's Amsterdam Travel Guide:Colour maps and images throughoutHighlights and itineraries help you tailor your trip to your personal needs and interestsInsider tips to save time and money and get around like a local, avoiding crowds and trouble spotsEssential info at your fingertips - hours of operation, phone numbers, websites, transit tips, pricesHonest reviews for all budgets - eating, sleeping, sightseeing, going out, shopping, hidden gems that most guidebooks missCultural insights provide a richer, more rewarding travel experience - covering history, art, literature, music, architecture, Dutch designOver 34 maps for easy navigationCovers Medieval Centre & Red Light District, Nieuwmarkt, Plantage & the Eastern Islands, Western Canal Ring, Southern Canal Ring, Jordaan & the West, Vondelpark & the South, De Pijp, Oosterpark & East of the Amstel, Amsterdam Noord, and moreThe Perfect Choice: Lonely Planet Amsterdam is our most comprehensive guide to the city, and is perfect for discovering both popular and offbeat experiences. Looking for just the highlights of Amsterdam? Pocket Amsterdam is our handy-sized guide featuring the best sights and experiences for a short break or weekend away. Want more extensive coverage? Check out Lonely Planet's The Netherlands guide. About Lonely Planet: Lonely Planet is a leading travel media company and the world's number one travel guidebook brand, providing both inspiring and trustworthy information for every kind of traveller since 1973. You'll also find our content online, and in mobile apps, video, 14 languages, nine international magazines, armchair and lifestyle books, ebooks, and more. TripAdvisor Travelers' Choice Awards 2012, 2013, 2014, 2015 and 2016 winner in Favorite Travel Guide category`Lonely Planet guides are, quite simply, like no other.' - New York Times`Lonely Planet.